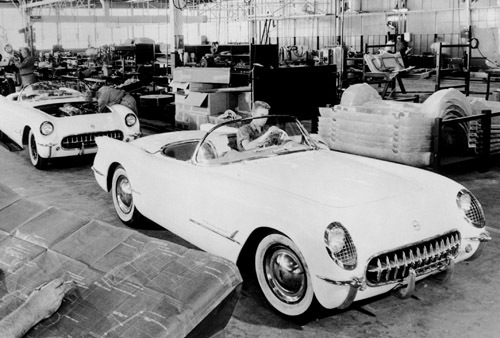 It was the first of only 300 hand-assembled Corvettes to be produced that year. Designed by Harvey Earl, the Corvette was an attempt to extract and Americanize the essence of the European roadsters, regaled by US soldiers, who were in Europe during World War II and the following occupation. Each of those first models were all painted Polar White, with matching interiors in a red and white color scheme, retailing for a sum laughable today – $3,498. It was named after a small watercraft used extensively in the War for the Pacific. In 2006, the third model built sold for $1.06 million at auction. The Chevy Corvette has seen seven generation across six decades and is the world’s longest running passenger car in continuous production. During that time it has carved out a niche as America’s one and only, truly iconic sports car. Until 1955, it was only available with a V6 engine, until the optional V8 was chosen by 90 percent of all buyers. It has been a V8 powered vehicle ever since. Until 1963, the Chevy Corvette was only built as a convertible – that’s when the first Corvette Sting Ray coupe with its hard top and split rear window launched the second-generation.. Sales instantly doubled by making it a year-round car for drivers in colder climates. Since that day 60 years ago when the first Corvette rolled off the line, approximately 1.56 million Corvettes have been produced. The 500,000th Corvette was created in 1977; the millionth was fabricated in 1992, and the 1.5 millionth Chevrolet Corvette rolled off the line in 2009. So by 2025, the 2 million mark should be reached and it’s unlikely even Federal CAFE standards can prevent it. It should be noted that no 1983 Corvettes were sold to the public, even though 44 were built. That model year was skipped over as the company prepared to put the fourth generation C4 models into production. Only one of the 1983 prototypes remains on display at the National Corvette Museum, in Bowling Green KY. So Torque News raises a toast to an American automotive icon for its 60 years of innovation, performance and a starring role in the sweetest dreams of millions.